Sometimes players call me and say, “I just bought a Crook guitar used, and it is nothing like the Crook I own or the ones I have played before.” My response is always that every guitar I make is custom-built to your desire. We’ve all had the experience of selecting a guitar from several standard models and choosing whatever came close to what we really wanted. But after we got the guitar home and started playing it, we’d begin the “What if?” game. “What if it had different pickups? It would sound better.” “What if it had a vintage style bridge?” “I really like this guitar, but what if it had a bigger neck?” There’s a reason there are so many aftermarket companies building replacement parts. It can be an expensive and frustrating game. It’s why I built my first guitar in the early 80s. I just couldn’t buy the guitar I wanted. Around that time, I started a career as a touring sound engineer and was lucky enough to work closely with many great players. On the road, they discussed the shortcomings of their vintage style guitars, and then I’d update the instruments with modern features to make them usable in the real world and to improve stage sound and playability. Plus, I was in the position to hear the results when I mixed a live show. On-the-side, I started building guitars for others and implemented a lot of those ideas from the road. The orders grew. What Is a Crook Custom Guitar? 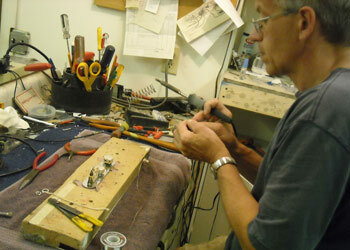 To design your ideal electric guitar, we’ll talk one-on-one. I want to find out what you play now, and to learn what you like and don’t like about your guitars. I’ll ask about the sound you’re looking for and the finish you have in mind. Even if you do not know your exact specifications, we’ll talk through them together. We’ll come up with all the details and specs: neck size and shape, hardware and electronics, body style, paint scheme, and wood type and weight. I can make recommendations based on my 20+ years of experience building hundreds of guitars. The ordering experience shouldn’t be a difficult process. It should be exciting! What player doesn’t love to talk about that dream guitar? My ultimate goal is to build your guitar for you. Give me a call.